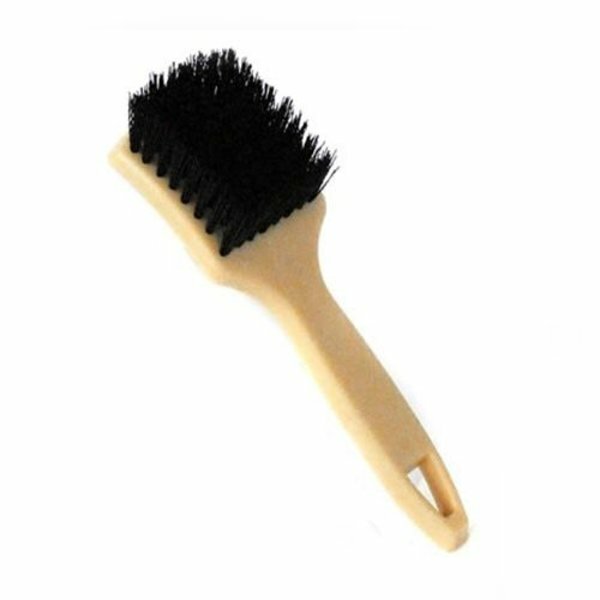 The Chemical Guys Polishing Pad Cleaning Brush makes it easy to clean and condition any foam, microfiber, or wool buffing and polishing pad. While polishing with a machine, pads fill up with spent polish, removed paint residue, and any leftover contamination stuck on the surface. This residue clogs up foam pores, holds down microfiber threads, tangles wool strands, and reduces polishing effectiveness enough to ruin any job. Clean polish and paint residue from any type of buffing pad with the Polishing Pad Cleaning Brush. Cleaning out residue restores full cutting capability for faster and more effective polishing. 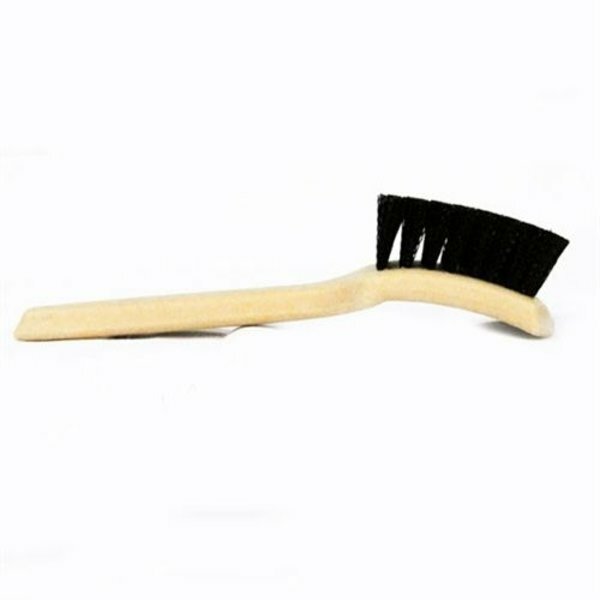 The Polishing Pad Cleaning Brush is extremely versatile and easy-to-use for all detailing professionals and enthusiasts. The heavy-duty construction and ergonomic design stands up to years of heavy detailing use. The injection molded plastic handle and tough synthetic bristles can scrub any pad by hand, or on any machine polisher. Take the polishing pad off the machine, and scrub it under warm running water with the Polishing Pad Cleaning Brush. More advanced detailing professionals turn their machine over and simply push the Polishing Pad Cleaning Brush across the spinning pad for maximum cleaning power. Pair the Polishing Pad Cleaning Brush with premium Chemical Guys Polishing Pad Cleaner for thorough cleaning on even the dirtiest polishing pads. Clean pads perform better, last longer, and save time when polishing any vehicle. Spend less time cleaning pads, less money on replacement pads, and more time polishing any vehicle to perfection with the Chemical Guys Polishing Pad Cleaning Brush. Even with good technique and correct usage, polishing pads fill up with spent product and paint residue. This gunk clogs up foam pores, tangles microfiber and wool strands, and causes uneven and poor polishing results. Without proper cleaning, the residue penetrates deep into any foam pad, causes overheating, and tears the pad apart over time. An experienced detailer can polish an entire car with just one pass; his secret is regular pad cleaning. Choose the Chemical Guys Polishing Pad Cleaning Brush to scrub away caked up polish, dead paint, and embedded contaminants from any foam, microfiber, or wool buffing pad. The stiff synthetic bristles scrub and agitate residue and debris out from deep within polishing pads for a thorough treatment. The Polishing Pad Cleaning Brush also conditions pads for maximum polishing effect on their next pass. Microfiber strands get matted and pushed flat as they spin; the Pad Cleaning Brush fluffs and stands these strands back up for full polishing ability. Keep polishing pads cleaned, conditioned, and ready for action with the Chemical Guys Polishing Pad Cleaning Brush. The Polishing Pad Cleaning Brush is great for powerful cleaning on foam, microfiber, and wool buffing and polishing pads. The stiff synthetic bristles easily scrub, agitate, and clean used polish, paint residue, and removed dirt and debris from any polishing pad. The durable brush is contoured to the human hand for comfortable ergonomics, powerful cleaning, and low fatigue with extended scrubbing. The abrasion-resistant handle is cast from durable injection-molded plastic, and lasts for years of rugged detailing use. Stiff bristles gently scrub residue and debris from buffing and polishing pads, and quickly restores them to full power on any polishing job. Simply rinse any clogged polishing pad with warm water, give it 1-3 sprays of Polishing Pad Cleaner, then scrub vigorously with the Polishing Pad Cleaning Brush. Rinse away the loosened residue and debris and let the pad air dry. Clean and rejuvenate pads after polishing 2-3 full sized car panels, or after noticing reduced cutting powers and extended worktime. Cleaning pads with the Polishing Pad Cleaning Brush restores cutting power to foam, microfiber, and wool buffing pads. Dirty and used-up polishing pads do not cut, so cleaning pads on the fly saves time when polishing a car. Using the same pad once it is caked with used polish and residue wastes time because it takes longer to produce satisfactory results. The only alternatives are to waste money on enough pads to polish the entire vehicle, or have one inexpensive brush to clean and reuse the same pad. The Polishing Pad Brush cleans and restores pads to like new condition so they compound and polish like a fresh one. Smart Detailing University at Chemical Guys uses the same polishing pads for years on end to teach various detailing courses. The secret to pad longevity is proper maintenance and thorough cleaning after every use. The Polishing Pad Cleaning Brush is the quick and inexpensive solution to clean and restore buffing pads for superior results. Carefully remove the polishing pad from the hook and loop backing plate. Spray 1-3 spritzes of clean water and Chemical Guys Polishing Pad Cleaner, then scrub vigorously with the Polishing Pad Cleaning Brush. Rinse the pad with running water, then gently wring out excess water and loosened debris. Let the pad air dry, or give it a couple quick spins on your machine polisher to knock out any remaining water before returning to work. Make sure to spin the pad in a safe direction that can get wet. Professionals sometimes leave extremely filthy or blocked up pads on the machine polisher for fasting cleaning results. Spray 1-3 spritzes of clean water and Chemical Guys Polishing Pad Cleaner on the pad. Hold the Polishing Pad Cleaning Brush against the pad, then turn the machine on speed setting 2 - 4.